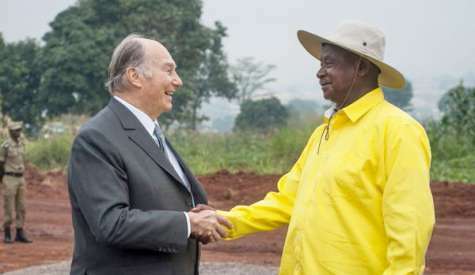 Prince Shah Karim Al Husseini Agha Khan IV, the 49th Imam of Nizari Ismailis is to be awarded the honorary citizenship of Kampala award in recognition of the role of his foundation to the development of Uganda's capital city. Honorary citizenship is a status bestowed by a country or a city on a foreign individual considered to be especially admirable or otherwise worthy of the distinction. In countries like Ireland, the title comes with full legal status including the right to reside and vote. This will be the first time that Kampala Capital City Authority (KCCA) is giving out such an award to a reputable figure, according to KCCA acting director of public and corporate affairs Peter Kauju. He says that the award will be received by the Aga Khan Foundation during celebrations to mark the 60 anniversary of Prince Karim Agha Khan's ascension to the Ismaili Imamat throne. "We have not had anything like that (award) before but since it's the request of the governing body of the city and the policy makers, we shall do it. I don't want to preempt what will come out of the process," Kauju said. He says Aga Khan's investments have made a huge contribution towards Uganda social economic development. The foundation's engagement in Uganda spans more than 70 years. The foundations portfolio includes investments in businesses, education, media, health, hotels and power generation. "His Highness the Agha Khan has done a lot of things for Uganda but also Kampala. Am sure you are aware that there’s actually the construction of the Aga Khan hospital and training centre here in Kampala. The things that Aga Khan is doing depict him as having made huge community contributions", Kauju added. Industrial Promotion Services (IPS), the infrastructure and industrial development arm of the Aga Khan Fund for Economic Development owns the 250MW Bujagali Hydro power plant constructed at a cost of nearly $900 million. The foundation is also building a $100 million hospital in Nakawa division, Kampala. The aim of the foundation, according to the Agha Khan website is to support sustainable development in Uganda with projects that have demonstrable, measurable outcomes in empowering individuals to improve their quality of life. Kampala Lord Mayor Erias Lukwago early this week asked the management of KCCA to prepare the award. Kauju told URN they are making all the necessary arrangements for the award and will announce soon, which medal will be awarded to Aga Khan. "In our special authority meeting, the Lord Mayor of Kampala suggested that as His Highness the Aga Khan marks 60 years on the throne, one of the proposals he would wish to do, is to award him an Honorary citizenship of Kampala or Freedom of Kampala City Award. He asked that management considers it and so it is just two days since this proposal came through and we are making the necessary consultations. When we have it done, we shall be able to share which one of the two we shall be able to go with", he said. Kauju adds that as part of the arrangement, KCCA will come up with privileges that such medalists receive when they are in Kampala. Prince Karim Aga Khan already holds the honorary citizenship of Canada, which was awarded to him by former Canadian Prime Minister Stephen Harper in 2009. He is only the fifth person in Canadian history to be given the distinction.